Collecting Children's Books: Now She Tells Us! It's difficult to imagine our favorite childhood books without the artwork that originally embellished, enhanced, and elevated the stories. 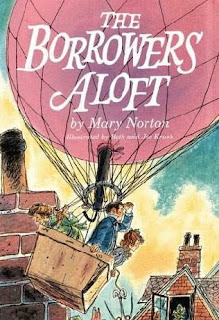 Remember Beth and Joe Krush's wonderfully-detailed illustrations for Mary Norton's books about the Borrowers? Recently I was intrigued to learn that the Krushes were not the first illustrators to draw the little people -- Arrietty, Pod, and Homily -- who live beneath a grandfather clock and "borrow" from the "human beans" residing in the house above. 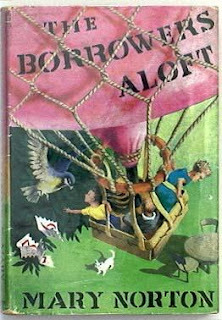 When the British edition of THE BORROWERS was originally published in 1952, the art was created by Diana Stanley. Editor Margaret McElderry, then working at Harcourt, purchased the U.S. rights to the book and released it the following year, with new illustrations by Joe and Beth Krush. They were paid a flat fee of $500 for their contribution. The final volume in the series was THE BORROWERS AVENGED, which was published in 1982. By this point the Krushes had worked their way up to a $5000 flat fee for illutrating the book. It's fascinating to compare the illustrations from the different editions of these books. Here are two dining scenes, presented side by side. It appears to me that Ms. Stanley's work has more of a "fine art" style, while Mr. And Mrs. Krush are working more in a "line drawing" mode. Incidentally, people often wonder how two artists -- even those as closely linked as husband-and-wife -- could create single illustrations. Beth Krush, who died a few months ago at age ninety, once explained, "When we work together we usually pick the incidents and talk over the staging together, then Joe does the first composition and perspective sketch. Then I rework that, adding my ideas and looking up costumes, interiors, plants, animals, and people. Most often Joe does the final rendering in his own decorative line." Personally, I prefer the latter type of illustration, which reveals the almost Dickensian characterizations of Pod, Homily, and Arrietty, as well as some evocative details about their period clothing and individualized belongings. In comparsion, Ms. Stanley makes the borrowers somewhat more generic. 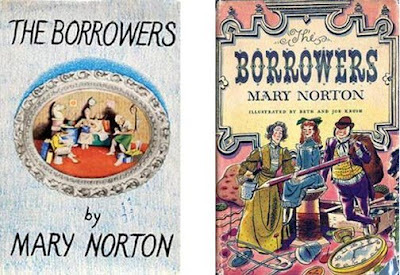 But which version did author Mary Norton prefer? Beth Krush revealed, "When our BORROWERS work was ending, Norton sent a single letter saying she liked our drawings but some things in them were a little too fancy for Homily to make. If Norton had told us earlier, we would have gladly arranged changes." How odd that Ms. Norton waited thirty years before voicing an opinion. Can't you just hear the Krushes saying, "NOW she tells us?" But, personally, I am just as glad she waited. I can't imagine these books without the Krush illustrations. They make Arriety, Pod, and Homily come alive through expression and detail. Of course part of the reason I'm so fond of this artwork may simply be because I'm familiar with Beth and Joe Krush (their work highlighted so many books of my youth, including Elizabeth Enright's GONE-AWAY LAKE)...or because their illustration style is somehow more appealing to my own American tastes. 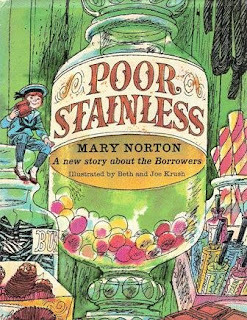 Probably right now, on the other side of the Atlantic, a British blogger is writing a piece about THE BORROWERS, explaining why he prefers Diana Stanley's work. After all, whether you're American or English: it's difficult to imagine our favorite childhood books without the artwork that originally embellished, enhanced, and elevated the stories. It's interesting that the Krush's always get credit on the cover, but not Diane Stanley. Beth and Jo Krush lived in the town where I grew up. When I was in fourth or fifth grade -- in the early sixties -- they visited my elementary school, and talked to all of us in the auditorium. This was the first time I understood that books were written and illustrated by real people -- not by remote gods, most of whom were dead or English, or both. I was thrilled and inspired, and in my memory, hearing the Krushes speak was one of the magic markers that led to me eventually writing for children myself. I KNEW that I knew the Krush name- just could not place it. The tie in to the Enright books (two of my all time favorites) was what I was vainly trying to remember. Jeanne: That's a great story. And if the Krushes read your books, I'm sure they'd be thrilled to see what they helped inspire. THE PENDERWICKS and THE PENDERWICKS ON GARDAM STREET are two of my absolute favorites. Kinderny: I got a kick out of seeing you mention the Enright books right beneath a posting from Jeanne Birdsall. If you're a fan of Enright, I can pretty much guarantee you'll love the Pendericks as well. They're terrific. "...it's difficult to imagine our favorite childhood books without the artwork that originally embellished, enhanced, and elevated the stories." On the flip side, I read some of my favorite childhood books in editions without illustrations, and was later surprised to find that originally they were illustrated. My best example is Beverly Cleary's teen novels. I read Fifteen, Jean and Johnny, and Sister of the Bride in flimsy 1980s Dell Laurel-Leaf paperbacks, no illustrations. As an adult I purchased vintage hardcovers of all three books--illustrated by Beth and Joe Krush. Each time I read these editions I am pleased and surprised anew to see the illustrations. It's quite a different reading experience. The Krushes were THE illustrators of the 60s. They illustrated Beverly Cleary, Mary Norton, Elizabeth Enright, Alberta Constant (Those Miller Girls, a personal fave). And those were just off the top of my head. And innumerable covers. I wish they could have gotten some kind of lifetime achievement award from ALA.
Take a look at Laurel Snyder's Any Which Wall. The illustrations have a definite Krush quality to them, and the story an Enright one. Interesting that these two would go together so strongly! The British illustrations for The Borrowers Avenged, the cover of which you show here, were done not by Diana Stanley but by Pauline Baynes. Baynes was the illustrator for the first editions of the Narnia books in the UK and the US, having been introduced to C S Lewis by Tolkien; I don't really like the Stanley illustrations and would have loved Baynes to have done the whole series. Thank you for this wonderful post! I grew up with the Borrowers and am now introducing my children to them. Like you, I absolutely LOVE the Krush's illustrations and cannot imagine the books without them. For me, any book with illustrations by the Beth and Joe Krush is well worth reading. I think possibly one of the few artists today with the same charm would be Steven Kellogg. I was fortunate enough to find older editions of Beverly Cleary's books for teens; as Laurie mentioned in an above comment the Krushes did the illustrations for those Cleary books and they are wonderful pen and ink line drawings. The Krushes made the Cleary characters come alive for me. My one disappointment is that "The Luckiest Girl" by Beverly Cleary seems to be the one teen book of hers that had no Krush illustrations, in fact no drawings at all save one on the cover.